Posted On February 24, 2015 by Team iCynosure. Silk sarees are a woman’s priced possessions that she loves to flaunt time and again, as and when the occasion demands. Draping a Banarasi saree is a joy that is unparallel to anything else. However as Banarasi silk sarees are passed down from generation to generation it is very important to maintain and preserve their beauty. Unfortunately the fear of ruining this treasure makes many women do the unthinkable… never wear the saree in fear of getting them dirty and storing them in a box in their closet. But that’s not how you maintain and preserve your sarees. To preserve your silk saree, first and foremost ‘Wear Your Saree’. Maintaining your silk saree is a tedious task, especially when you want to preserve the shine and luster. 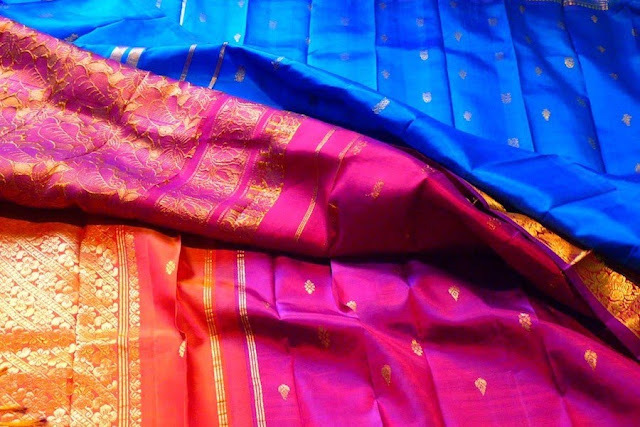 Silk sarees are washable; even at home, though dry cleaning is the best available option. Your aim while cleaning your saree must be to maintain the shine and luster along with the crispness of the design. When you decide to wash your silk saree at home, never ever use soap at the start of the cleaning. First soak it in salt water for 20-30 minutes and then rinse it with cold water. Wash the saree a couple of times in plain water and then clean it quickly with mild detergent. First wash the pallu and the border finally moving onto the body. Avoid scrubbing with a brush, or bundling it up to un-crease the saree. After washing gently squeeze the excess water from the saree and hang it on the clothes line to dry, preferable out of direct sunlight. Lime juice is a miracle for removing stains. Add a few drops of lime juice to water to remove stains from silk sarees; however make sure you rinse it immediately as lime water tends to fade the cloth color. If it’s a stubborn stain then soak the area with petrol and scrub it lightly with a brush or soft cloth. The best time to iron your saree is when it is slightly damp, if not then dampen it using a spray bottle. Set the iron on medium to low heat, test a small corner first and begin by straightening the edges and the border. Fold the saree into half and iron each side while continuing to fold it into half further on. Keep your silk sarees neatly stacked up in your closet or in a box away from dust and light. However don’t store your saree in a plastic pouch as it doesn’t give the cloth any breathing space, instead bundle it in a clean white cloth. If you don’t use your sarees regularly, bring it out for some fresh air and/or leave a few dried neem leaves next to them in your closet. Even when you do so, always look out for new designs and patterns to add to your collection. Stay tuned for a special offer for iCynosure readers! I always tens when i wear silk sarees, these tips help me lot for washing & storing silk saree. Thanks for sharing !